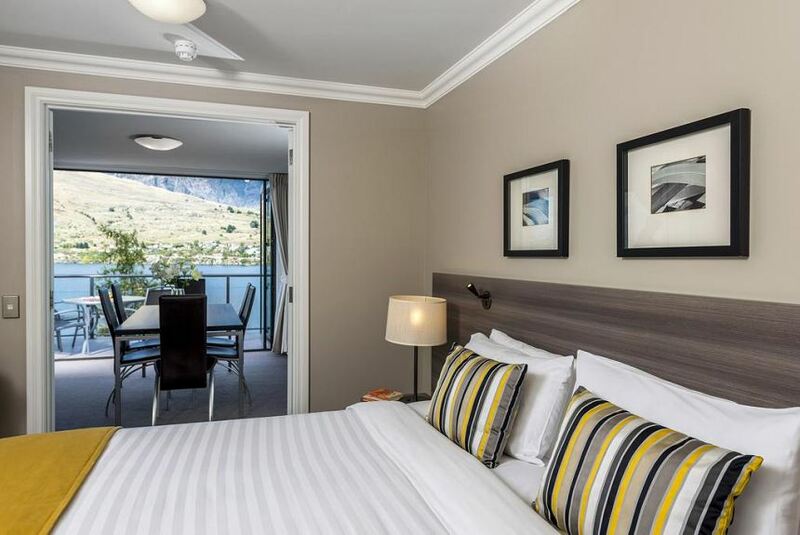 This apartment-style hotel is nestled on the shores of Queenstown's Lake Wakatipu, offering stunning views over the lake and surrounding mountain ranges. Facilities include a fitness center and sauna. All accommodations at Oaks Shores Queenstown comes with daily mini room servicing, under floor heating and a flat-screen TV with satellite channels. Some accommodations includes a seating area with fireplace. Guests enjoy 30 minutes' of free WiFi per day in the room. Guests can benefit from the convenient 24-hour reception Oaks Shores provides. The hotel also offers a laundry service, a tour desk and a courtyard. There is a free shuttle service to and from central Queenstown, running each morning and evening. The many shops, restaurants and bars of Queenstown’s town center are just 5 minutes' drive away. Oaks Shores is 3.1 mi from Queenstown Airport, and 2.5 mi from the junction of State Highways 6 and 6A.